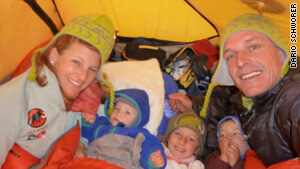 Swiss family Schworer make a tent their home while on their global adventure. Katmandu, Nepal (CNN) -- Traveling around the world with children is difficult enough, but attempting it without using motorized transport is even more of a challenge. But Dario Schworer, a 42-year-old climatologist and mountain guide, and his 33-year-old wife Sabine Schworer-Ammaun are on a mission to do just that. The Swiss couple want to travel across the world's oceans and climb the highest mountain on every continent to promote Earth-friendly ways of life. "We are collecting good examples of dealing with climate change and living in harmony with nature and spreading such ideas," Schworer told CNN. "We want to help people cope [who are] affected by global warming and inspiring children for the future." In Katmandu recently after having spent three months teaching children in the Everest region (Schworer also climbed Everest, although he didn't reach the summit), the intrepid couple told CNN that they want to show it is possible to travel through all the world's climate zones using just human-power and the forces of nature. "Great achievements can be done in harmony with nature," Schworer said. "But we must respect nature." In the 47 countries they have visited so far they have collected 22 tons of trash, taught people in Ecuador how the sun's rays can be used to purify water and inspired a person in Chile to build a house on water with recycled plastic bottles as a foundation (something they learned while in the Caribbean). They have also collected trash in the mountains of Nepal with school children. So far they have interacted with 45,000 children from South America, Australia and Asia, giving presentations about the importance of recycling and using alternative energy like solar and wind power. "We need to motivate children," said Schworer-Ammaun. "Sailing, cycling and climbing are sports and with sports we can communicate to children very well," added Schworer. When they began their quest in 2003 they had no children of their own. But since then two has become five: daughter Sabine is now five-years-old, three-and-half-year-old Andri was born in Patagonia in Chile and nine-month-old Noe was born Darwin, Australia. The couple began their trip in Europe before sailing to the Caribbean, and then on to the Galapagos Islands and Chile to climb Aconcagua, the highest mountain in South America. After sailing across the Pacific they cycled across Australia and climbed its highest peak, Mount Koscuiszko. But there have been some bumps along the way. The couple's sailing boat "Panchamama" (meaning "Mother Earth" in Quechua) was hit by a container ship on the way to Chile and took more than one year to repair, and they could not land in Antarctica to climb Mount Vinson because of thick sea ice. The family has been back home to Switzerland a few times since they began their adventure "to show the children to the family" and also to have two emergency operations for Noe who has a kidney ailment. "The children are otherwise fine," Schworer-Ammaun said. "They are getting home schooling and whenever they are at place for some months they join a school. "Finding children for them to play with has been the most challenging." After leaving Kathmandu they will cycle to Shanghai, via Lhasa and the high Tibetan plateau where the average altitude is 4,000 meters. When they reach the Chinese megacity the couple will make a presentation at the World Expo. After China the plan for the couple is to collect their boat in Thailand and sail to Africa to tackle Mount Kilimanjaro before making another attempt at Antarctica and then North America via the Northwest Passage. Initially the couple thought they would complete their travels in four years, but now, seven years later, they believe it could take seven more. "Since our belief is the need to respect nature, we travel only when conditions are good," Schworer said.